Two years after the first Bouw-RAI a second such ‘model district’ took shape, this time shared among 36 designers. 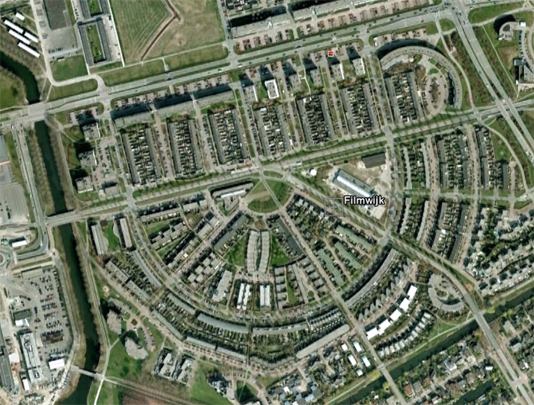 In response to the somewhat chaotic urban framework of Bouw-RAI I, these new schemes were sited in a taut, radial plan. Filling in this radial plan with a mixed bag of mostly rectilinear blocks was evidently no easy task. Though the materials, colours and shapes are decidedly contemporary, this time there is little evidence of experimentation with new dwelling forms. Notable exceptions are Sjoerd Soeters’ ‘Modern Acropolisme’ and the comparable line taken by Fons Verheijen, and the schemes by Mecanoo, Quist, Loof & Van Stigt, Van Dongen and Lafour & Wijk. Projects: Loof & Van Stigt (James Stewartstraat), Sj. Soeters (Ingrid Bergmanstraat/James Stewartstraat), Inbo/Gjalt de Jong (Humphrey Bogartstraat), Lafour & Wijk (Hollywoodlaan), F.J. van Dongen, de Architekten Cie. (Hollywoodlaan), Mecanoo (Grace Kellystraat), A.P.J.M. Verheijen (Bette Davisstraat).